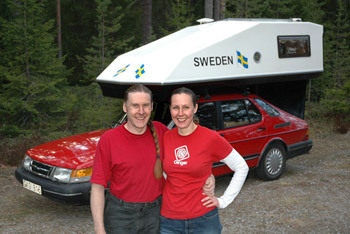 Our car a SAAB 900, 1992 with a Toppola camper is bigger than you think. A spacious double bed covers the roof of the car. And we have made a completely new interior for this trip. We have built stashing for clothes, food, kitchen were etcetera. 40 litre refrigerator that runs on solar energy. TV-antenna for a computer with a TV-card, portable shower, camper chairs and camper table. shuffle, tow line, snow chins, repair manuals, fire out. the in the rear where there also is room enough stand up straight. It takes a whole lot of smart solutions to make room for two persons and all this equipment. This is really compact living in extreme! The weight of the camper is only 140 kg (+ our equipment). To drive it fells like a normal car. But everywhere we go people seems to think that this is a really strange vehicle and laughs and points at us.